Bushes or shrubs are an ideal landscape plant to use around the home and garden for height, texture and year-round color. As an evergreen shrub, they provide warmth and foliage color throughout the year, including winter. Grown in a wide range of shapes, sizes and bloom colors, bushes also make ideal screening or barrier plants when grown in masses along the landscape. Tucked along a front entrance or lining the driveway, flowering shrubs help to provide a focal point to the landscape. Paleleaf barberry (Berberis candidula) is an evergreen shrub with a slow growth rate and medium to fine texture. They grow 2 to 4 feet tall and have a spread of 3 to 5 feet wide. Paleleaf barberry shrubs have a dense, low-growing, hemispherical form with arching stems. The 1/2-inch wide yellow flowers grow along the long pedicel or stem in early summer and are followed by the 1/2-inch wide purple, fall-developing berries. Paleleaf barberry shrubs have 1- to 2-inch long shiny, dark green leaves that are leather-like with spined margins. During winter the foliage on paleleaf barberries may cast a red tinge. Paleleaf barberry shrubs are easy to transplant and withstand severe pruning, two ideal qualities in a shrub. They grow best in full sun to part shade and require well-drained, moist soil. Plant paleleaf barberry shrubs in USDA zones 6 to 8. Lilac (Syringa vulgaris) is a deciduous shrub variety with a moderate growth rate. They grow 8 to 15 feet tall, 6 to 12 feet wide and have an upright, stiff form with ascending branches that hold the colorful blooms. The fragrant, single to double, spring-blooming flowers on lilac shrubs grow in a wide range of colors including, white, purple, cream and pink. The dark green to blue heart-shaped leaves on lilac bushes grow 2 to 5 inches long. Lilac grows best in full sun to part shade and tolerates a wide range of soil varieties, including heavy soil. They are suitable in USDA zones 3b to 7. Forsythia (Forsythia ‘Courtasol’) is a spring-blooming deciduous shrub with a rapid growth rate and running habit. They grow 1 to 3 feet tall and wide and produce masses of vibrant blooms. The grapefruit yellow flowers on forsythia shrubs grow along the 18-inch long arching stems. As a low-growing forsythia variety, this shrub is ideal grown along a front bed or used as a ground cover. 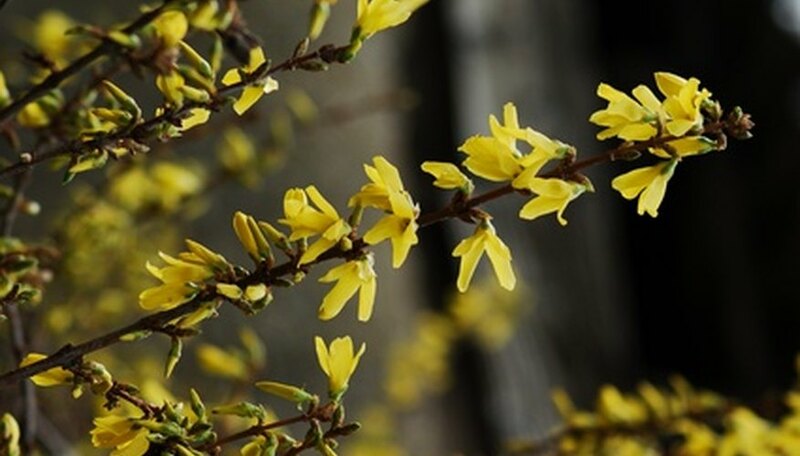 Forsythia grows best in full sun to part shade and well-drained soil but is adaptable to any soil type. They grow best in USDA zones 5 to 8.